Monster Energy Yamaha Factory Racing’s Romain Febvre delivered a silver medal performance in the Open Class on-board the all-new 2018 YZ450FM at the Monster Energy FIM Motocross of Nations, which crowned a historic weekend for Team France with the team landing on the top step of the podium for the fourth year in a row. Constant rain throughout the weekend made the 71st edition of the Monster Energy FIM Motocross of Nations some sort of beautiful chaos. The spectacular track and venue in Matterley Basin was drenched by overnight rain which made for an extremely rough and rutty surface. Despite the loathsome weather, more than 60,000 umbrella sheltered fans covered the rolling hills and warmly embraced the spirit of grass roots racing as Romain Febvre flew the flag high for France with his incredible second place finish – without goggles – in the first Open class race of the day. In the final race of the weekend, the undeniable power and torque of the all-new 2018 YZ450F had Romain Febvre, Jeremy Van Horebeek and Arnaud Tonus making up the top-five on the exit of turn-one. Febvre had the partisan crowd going wild as he challenged the home soil hero – Team Great Britain’s Max Anstie – for the lead, while Van Horebeek and Tonus succumbed to the pressure of Holland’s vice World Champion Jeffrey Herlings. Every moment of drama, such as a pass or a mistake, saw the fans furiously erupt with emotion, which offered added excitement, even when Febvre pulled into Pit-Lane for a new set of goggles. 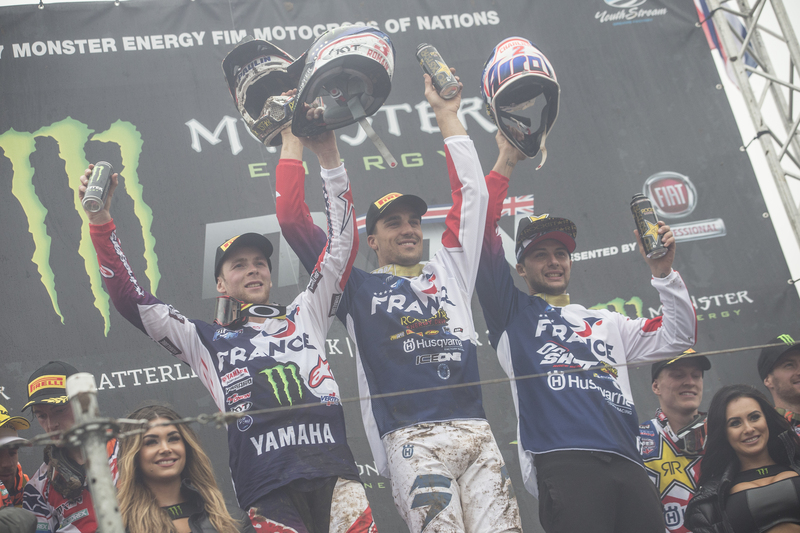 Despite a brief stop, which allowed Herlings to run away with second place, Febvre rode strong for third which was enough for second overall in his individual class, and the overall victory for his team, France. Van Horebeek had to use his signature first-lap charge in the opening race after he spun-up on the wet and muddy gate. The Belgian’s speed on-board the all-new YZ450FM was mind-blowing, although a small mistake later in the race meant he would only come home in seventh. A better start in the final race of the day saw him enjoy more time on the 2018 YZ450FM as he clicked off a series of solid laps for fourth place, which is where he finished in his individual class as well as where Team Belgium finished in the Nation’s Overall Classification. Wilvo Yamaha Official MXGP’s Arnaud Tonus and Team Switzerland finished fifth in class and in the overall classification. Tonus was once again impressive as he used a unique combination of patience and aggression to remain close enough to the front runners to apply pressure without taking a lot of risk. With one of the most elegant and smoothest riding styles in the world, Tonus’ unique line-choice saw him well placed after he finished fifth in the first race of the day. The final race started strong as he chased fellow Yamaha riders Febvre and Van Horebeek around turn-one. After running a hot pace in the initial phases, a few small errors ended up deluding the result he was capable of. Great Britain – the home of motocross – and a nation that oozes motocross racing heritage, has put a great end to the ‘racing’ year with an emphatic edition of the Monster Energy FIM Motocross of Nations. All three of Yamaha’s Official MXGP stars were happy with their performances on the all-new 2018 YZ450F, a bike that has left them in high spirits and excited to raise the bar in 2018.